Oh my goodness. What a week. Thank you all for your sweet comments about Peyton on my post on Friday. The Pilot and I were so appreciative of the support through what has been a surprisingly difficult week. Last Monday, Peyton stepped on broken glass and cut her paw. Tuesday morning, she was still bleeding so The Pilot took her to the vet. He asked them to check out a small lump we had noticed a few weeks ago and on Wednesday, she was diagnosed with cancer. 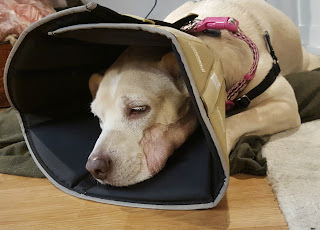 Thursday, we met with the veterinary oncologist (Yes, those exist. I had the same reaction) and Friday, she went in for surgery. It all happened so quickly, but our sweet pup is home and recovering. The Pilot and I didn't do much other than take care of Peyton this weekend. Friday, after we picked Peyton up from the vet, we took her to the pet store to pick up some food. Since the surgery was on her mouth, she's going to be on a soft food diet for the next few weeks, so we had to pick her up some wet food. We were absolutely exhausted and spent most of the night trying to keep Peyton comfortable before finally falling asleep. Saturday, we rearranged our apartment so that Peyton could maneuver it a little bit more easily with her cone. The funny thing is, I like it better this way! Sunday, The Pilot and I did some typical Sunday things, grocery shopping, laundry, etc. and I went out for a run. It was only my 4th run since Chicago and it was hard and I was out of breath, but it felt so good to get out there, especially given all of the stress of this week. If I'm being completely honest, I would have rolled my eyes at a post like this a year ago. Honestly. The last 5 days of my life have completely revolved around my dog. Thursday morning, I was so terrified that we were going to bring her to the vet and they were going to tell her that she had two months to live and that would be it. I came home from work Wednesday and just sobbed. I never ever thought that something like this would hit me so hard, but here we are. I'm hoping things settle down a bit as she starts to get better through the week and I'm anxiously awaiting the results of her biopsy. 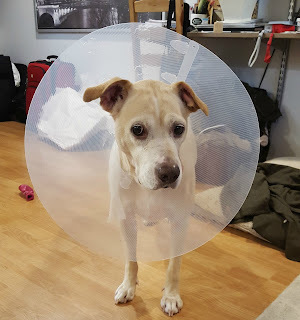 This week has been so hard, but it's amazing to see so many people reach out to help us out - whether it's to petsit Peyton while I'm at work, to give advice about how to keep her from getting out of her cone, or to help us offset the costs of her surgery. As you can imagine, Peyton's veterinary bills were costly and unexpected. The Pilot and I launched a Crowdrise campaign over the weekend to try and offset some of those costs and were blown away to see so many friends and family help us out.